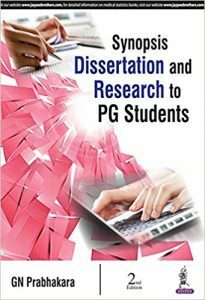 This book discusses about “Synopsis, Dissertation and Research to PG Students”. Thousands of postgraduates from different courses and disciplines from various universities, who are seeking guidance regarding their dissertation/thesis work with respect to the preparation of synopsis, methodology, designing research and final presentation, are responsible for the outcome of the book. Synopsis, dissertation and research are updated and elaborated for the use of all postgraduates in university of health sciences, viz. medical, dental, pharmacy, nursing, Ayurveda, homeopathy, hospital administration, and speech and hearing. This book is comprises total 11 chapters. This book provides lucid and comprehensive understanding on routine for a new postgraduate, time table for three-year postgraduate course, medical ethics involved in postgraduate work, designing research, preparation of synopsis of dissertation/research, know-how on actual dissertation/research, biostatistics for the dissertation/research, prevention of hospital acquired infection, computer technology in PG dissertation work, biostatistical tests for dissertation, etc.